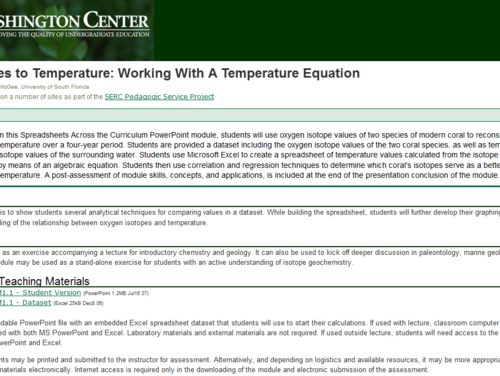 In this activity, students will use oxygen isotope values of two species of modern coral to reconstruct ambient water temperature over a four-year period. They use Microsoft Excel, or similar application, to create a spreadsheet of temperature values calculated from the isotope values of the corals by means of an algebraic equation. 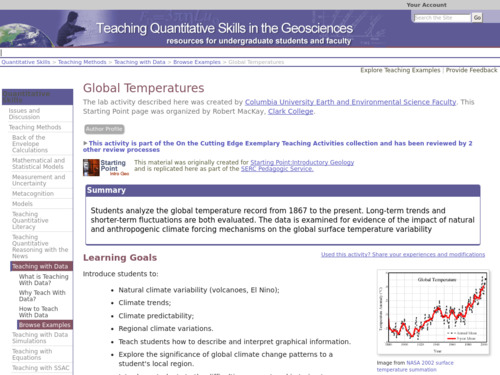 Students then use correlation and regression techniques to determine whether isotope records can be considered to be good proxies for records of past temperatures. 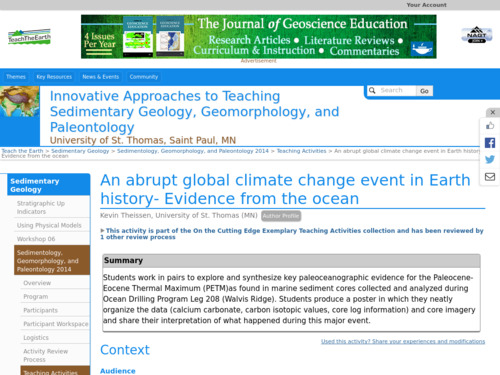 This activity focuses on reconstructing the Paleocene-Eocene Thermal Maximum (PETM) as an example of a relatively abrupt global warming period. 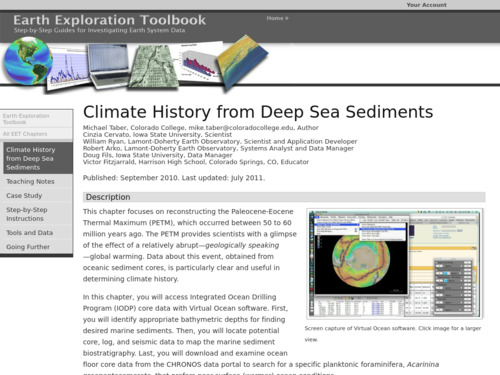 Students access Integrated Ocean Drilling Program (IODP) sediment core data with Virtual Ocean software in order to display relevant marine sediments and their biostratigraphy. 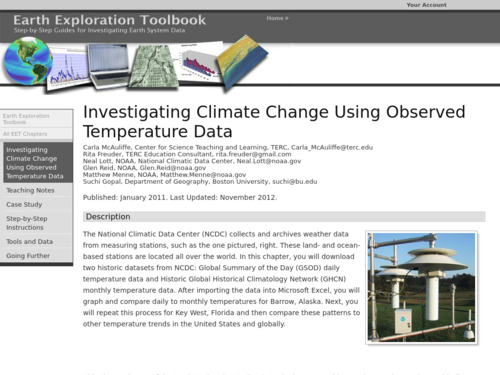 In this activity, students create graphs of real temperature data to investigate climate trends by analyzing the global temperature record from 1867 to the present. Long-term trends and shorter-term fluctuations are both evaluated.  The data is examined for evidence of the impact of natural and anthropogenic climate forcing mechanisms on the global surface temperature variability. 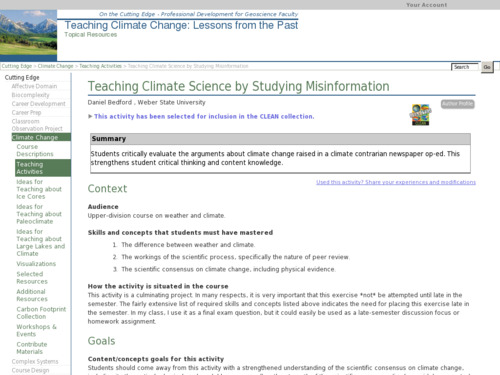 Students are prompted to determine the difficulties scientists face in using this data to make climate predictions. 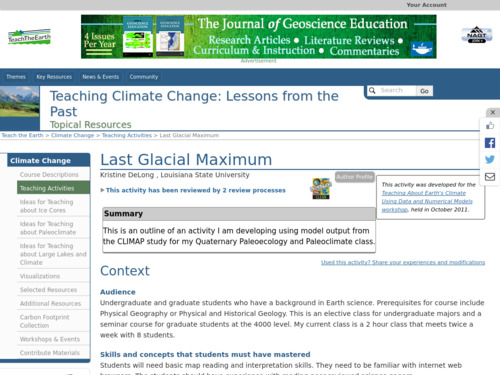 In this activity for undergraduates, students explore the CLIMAP (Climate: Long-Range Investigation, Mapping and Prediction) model results for differences between the modern and the Last Glacial Maximum (LGM) and discover the how climate and vegetation may have changed in different regions of the Earth based on scientific data. This activity is a research project in which students explore and synthesize key paleoceanographic evidence for the Paleocene-Eocene Thermal Maximum (PETM) as found in marine sediment cores collected and analyzed during Ocean Drilling Program Leg 208 (Walvis Ridge).